You can also see our rankings at: http://www.fadoo.ca/hockey. The Blackhawks seize the top spot. The Predators rocket to a top ranking. The ruins and Sens move up and the Red Wings plummet. Last week's ranking in parenthesis. The Hawks have won eight in a row going in to Friday’s game. They have not given up more than two goals in any game this past week, including a shutout in Vancouver. 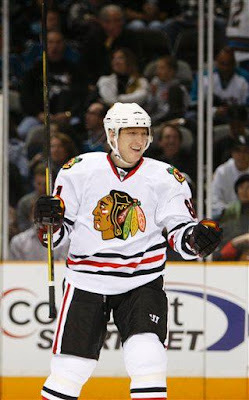 Hossa played his first game in a Chicago sweater and scored twice. A surging Chicago team just got 30 goals better. The Sharks were 2-1-0 last week, but were the victims of a 2-7 drubbing by the top ranked Blackhawks. The Pens won three straight to surge past New Jersey for the division lead. Crosby looks absolutely inspired… when not scoring he is battling, back checking and leading by example. Nashville is officially white hot winning seven in a row. Shootout or regulation, home or on the road, they have done whatever is necessary to get the “W”. Have won two of three including a win at LA. Iginla continues his torrid streak moving the Flames past the Kings in the standings. The Caps lost three of their last four. An embarrassing loss to the Leafs doesn’t look good. Washington’s defense has not been the culprit. They haven’t scored more than two goals in any game this week, aside from the game in Ottawa, when they scored three… but gave up four. Had lost three in a row until getting a win at home against Ottawa and fell behind Pittsburgh in the division. Colorado lost two of three and have lost six of their last eight. The Avs got Liles and Galairdi back from IR, maybe they can help stop the slide. The Sabres had lost four straight going in to Friday’s action. The team has struggled to score goals and have had a few uncharacteristically poor defensive lapses along the way. Miller will have to shut down their next opponent to right the ship. LA has not scored many goals this week and lost ground to Calgary. Frolov has stepped up is game in Smyth’s absence but Kopitar and the rest of the team went awol this week. The Stars move back up the charts led by a fired up Stephane Robidas who filled in the goal void left by James Neal’s suspension. The Sens have won five of their last six, handing losses to some top teams. Fisher continues to lead the way. Dany who? Lucic scored in his return to the lineup and the Bruins, winners of four straight going in to Friday have much more confidence and poise. When they get Savard back…watch out for the killer B’s! The Flyers took it on the chin this week losing three straight before shutting down the Islanders. Philly has been giving up a ton of goals lately. Will this defensive lapse push Emery to implode? Gaborik got wind of the other Marian’s return and cranked it up a notch. He is not getting enough credit for the season he is having. The Blueshirts are still inconsistent, but have the ability to bury their opponent on any given night. C’bus has lost four straight subjecting Mason to “sophomore slump” talk. The Jackets have not exactly lit up the scoreboard for him lately however. The Isles continue to battle every night. Roloson defies Father Time… uh, time and time again. His 58 saves Monday night were proof enough that he is not slowing down. Phoenix wants to keep the score low. The Coyotes season has been astonishing considering all of the turmoil surrounding this tight knit group. Suddenly the Wings cannot score goals. Detroit has been unusually streaky thus far. Has this veteran team hit a wall? Henrik Sedin has been playing for his injured brother as well as himself and the team. The Canucks are getting healthy again and are making their move. Tampa lost to both Carolina and Toronto. They move down as a result. Has that happened to any other team this year? Stamkos and Malone are still the story. When they don’t get help, the Lightning don’t win. The Thrashers lost three extremely tight games before shutting out Detroit this week. Atlanta never gives up, but need to stop digging holes for themselves early. The Panthers took care of Detroit and the Rangers, but then blew a late lead at home to Pittsburgh and were avenged by the same Rangers a few days later. Vokoun would do it all by himself if he could score regularly from the net. The Canadiens shipped problem child Latendresse to Minnesota and started playing better, losing only to the Stanley Cup Finalists. The Habs continue to push through despite recent injuries. They still are in dire need of getting Markov back. Finally starting to score some goals. Mason and Conklin have been there for the Blues all season. If St. Louis is now ready to support them offensively they can do some damage in the West. The Duck have shown some life! Giguere won his first of the season. Anaheim is finally giving their fans hope that this season may not be lost after all. Edmonton’s scattered play keeps them struggling. A shutout one night, and then allowing 5 goals the next. They have lost Hemsky for the res of the season, so it will not get any easier. The Wild have placed Martin Havlat on IR. If it were not for Carolina and Toronto having such horrible seasons, Minnesota would be the focus considering their fall. With so many changes both on and off the ice, it was expected for them to take time to adjust, but this is getting bad. It’s a toss up as to what team is the worst, but the Canes have found their way to the basement missing Staal and Ward. What is Toronto’s excuse? The Leafs had won twice this week going into Friday’s action…and were still at the bottom of the league. This season can still be salvaged to some degree. The team is relatively healthy and has plenty of depth…will they do it? I always deal with Aames Plumbing because that saves me a lot of time and lot of money as well. They are highly expert in anything related to plumbing services. I recommend them to everyone in Atlanta. Columbus and Filatov: Creating Zherdev Part II? Two Long Seasons Too Much on Pens?